You know it's a party when the Brie comes out! Next time, serve it on RITZ Crackers with ham, raspberry preserves and nuts. Top crackers with ham, folding as needed to fit crackers; cover with cheese. Broil, 4 inches from heat, 1 min. or until cheese begins to melt. Top with preserves and nuts. Substitute fig jam for the raspberry preserves. 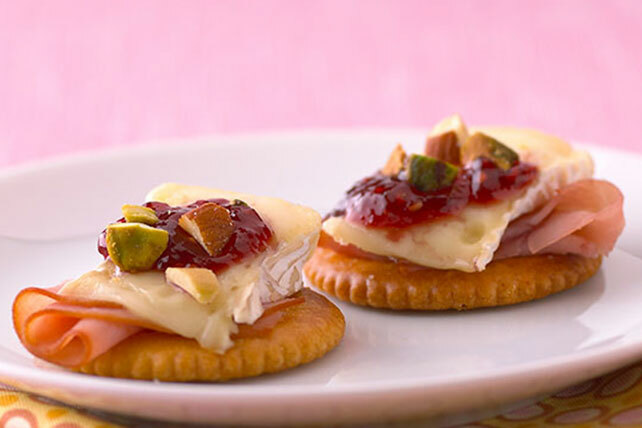 These fruity Brie toppers are equally delicious without broiling. Assemble as directed, then serve at room temperature. Prepare using OSCAR MAYER Deli Fresh Bold Brown Sugar Ham.